There is no Wild in this game which is a bit unusual but there are two scatters. The first scatter is the Map symbol. 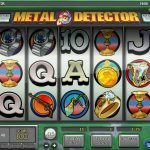 landing 3, 4 or 5 anywhere on the reels will trigger the Free Spins feature. You will be asked to pick a red cross on the map to determine the number of free spins and then to pick a spot to determine your multiplier. The second scatter is the Detector Guy symbol. Landing 3 or more will trigger the Bonus Round. In this round you will guide this guy on the beach to find spots where he should dig. Your prize will then be revealed! This game is quite basic design wise and the no Wild here is very disappointing. What’s good about it is that the bonus features are pretty easy to trigger. 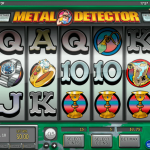 If you like older slots then give it a go. Think that love and money go together? 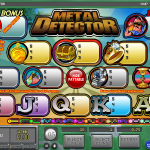 Try playing Love And Money a 5 reel slot by Rival.